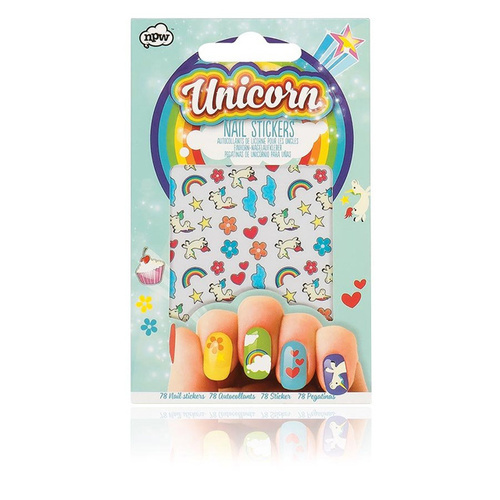 Unicorn Nail Stickers | Make your manicure a little more magical! Make your manicure a little more magical! Celebrate with unicorn-inspired nail art! Great for magical birthday parties! If you adore unicorns then decorate your nails with unicorn inspired nail art! Great for every day wear, this pack includes 78 fantastical nail stickers including unicorns, rainbows, clouds and flowers. Get your nails in tip top shape with the magical creature of the moment! They're easy to apply, simply peel off the stickers you require, apply them to dry nail polish, and use a good layer of top coat to secure them in place and keep them looking unbelievably good! You can use them over any colour polish, but light colours will give you the best effect. Each set includes 78 nail stickers. They're small enough for little hands (recommended for ages 3 and up).